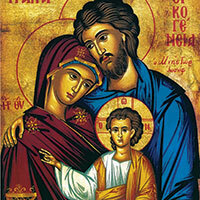 “Jesus, Mary and Joseph, in you we contemplate the splendour of true love, to you we turn with trust. Holy Family of Nazareth, may families never again experience violence, rejection and division: may all who have been hurt or scandalised find ready comfort and healing. Holy family of Nazareth, may the Synod of Bishops make us once more mindful of the sacredness of the family, and its beauty in God’s plan. 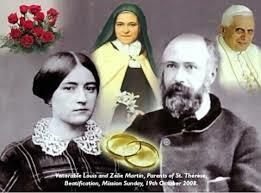 Parents of Saint Therese Blessed Louis and Zelie Martin, will be canonised in Rome today, 18th October 2015. Zelie & Louis lost 4 children in infancy/childbirth before raising 5 girls, all of whom joined religious life. The youngest was St Therese. A second of their daughters is also being proposed for canonisation. Saints Louis & Zelie, pray for us. 18th Oct Sun 10am-2pm KARINYA FETE – All Welcome! 19th Oct Mon 9.30am WRAP W LOVE in Hall. Weekly until further notice. Thank you. 21st Oct Wed 12.30pm MAJELLAN GROUP – Mass & Meeting at Marie Tomlinson’s, 19 Murray St., Corowa. 25th Oct MISSION SUNDAY – leaving collections at end of Mass. Envelopes avail. MASSES INTENTIONS 18th – 24th Oct. This week on The Journey Sr Hilda Scott OSB tells us “A Story”; Fr Dave Callaghan challenges us to “Rethink the Bible”; Marilyn Rodrigues gives us great tips on dealing with “Parenting Failure” and Bruce Downes shares an awesome reflection on how to “Let Go.” Tune into LIFE 101.9 FM or 98.5 THE LIGHT Albury Wodonga Sun 11am or go to www.jcr.org.au or www.itunes.jcr.org.au where you can listen anytime and subscribe to weekly shows by email.